Bifold doors open out off the lounge onto a sunny deck from which you can sit and sip our complimentary bottle of 26Rows overlooking the vineyard and Taraura Mountains. Ideal for a relaxing weekend couples retreat and only 1km away from the Martinborough Square, cafes, wineries and olive groves. Complimentary Continental breakfast provisions provided, using as many local products for you to try. Homemade biscuits to enjoy with a cup of Neighbourhood coffee or a selection of Dilmar Teas. A unique experience on staying on a boutique vineyard, only 1 km from the Martinborough Square. Generous provisions for a continental breakfast and a complimentary bottle of 26Rows, luxury linen. A Wine & Craft Beer Tasting included in your rate. At the Martinborough Brewery A tasting paddle of 4 x 75ml Martinborough Brewery Craft Beers A Wine tasting of 3 Vintages of 26Rows Sauvignon Blanc Wine Served with a Martinborough Brewery tasting platter. This must be booked prior your arrival at The Gatehouse On26Rows. All soaps and shampoo and condition provided. Using luxury bath towels. Cereals, tea, plunger coffee, home baking, local olive oil, sauces, jam, sugar, bread, butter, breakfast spreads, eggs and local fudge. Sit on the deck and enjoy the views of the vineyard with a glass of 26 Rows. We had a fabulous weekend at the Gatehouse. All amenities are of the highest quality and everything you can think of is there from chocolates to wine. The location is perfect for a quiet getaway. We were able to stroll amongst the vines with a wine in hand or relax on the deck. Everything we needed for breakfast was there whether we wanted cooked or just cereal and toast. I would recommend this spot to anyone. Thank you Karen, we certainly enjoyed having you stay in the Gatehouse, if you are ever back this way, would love to see you again. Happy Anniversary. You were the perfect guests. so managed quite well! No AC but with careful adjustment of windows and doors, the temperature was pleasant and there are wall heaters for the cooler months. The cottage has some outstanding features - a heated bathroom floor, glass doors that open fully, all the better to enjoy the view of the grape vines, and hear the birds. It is also a short 20-minute walk into the town center where good food, wine and coffee is available. Helen was a gracious and unobtrusive host and we enjoyed learning about their foray into grape growing etc. Thank you so much we enjoyed hosting you both. Enjoy the rest of your holiday. Great place to relax, enjoy good wine and food. Quiet, comfortable and amazing hosts. See you again soon! Wonderful guests a pleasure hosting you at the Gatehouse. Thank you so much for leaving the Gatehouse as you found it. The Gatehouse is a fantastic property. 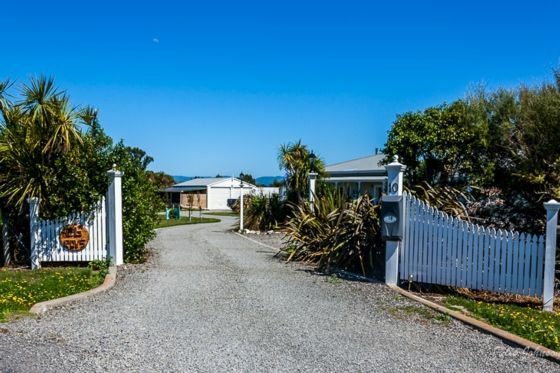 Really well equipped and comfortable and in a great location to explore Martinborough and the surrounding area. Can't recommend this one highly enough. Thank you so much David for your amazing comments. We so enjoyed hosting you both. Glad to hear it was just what you ordered. Fantastic place, fully equipped - everything you could need for your stay in Martinborough. Including beautiful linen on very comfortable beds and luxurious large bath towels. Lots of treats provided for you to make your own breakfasts including top of the range Lewis Road Butter and Milk and Puhoi Valley Yoghurt - Yum! Home baking as well. We also enjoyed the complimentary bottle of wine - thank you we will be back. Thank you for your wonderful feedback. It is greatly appreciated. It was such a pleasure to have you and your family and so pleased it was everything you hoped for and more. Enjoy your wine.